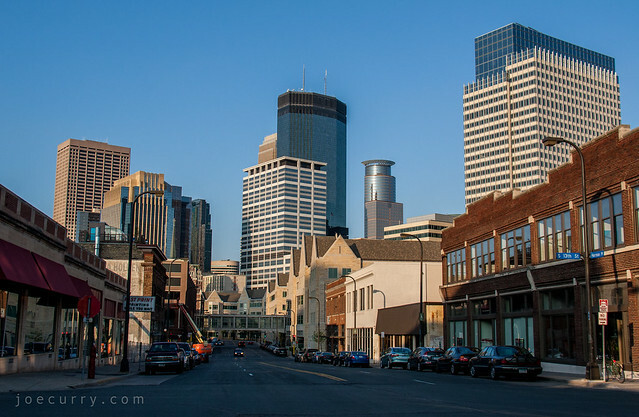 I hoofed it up Hennepin Ave to catch the setting sun on the ING Reliastar building. 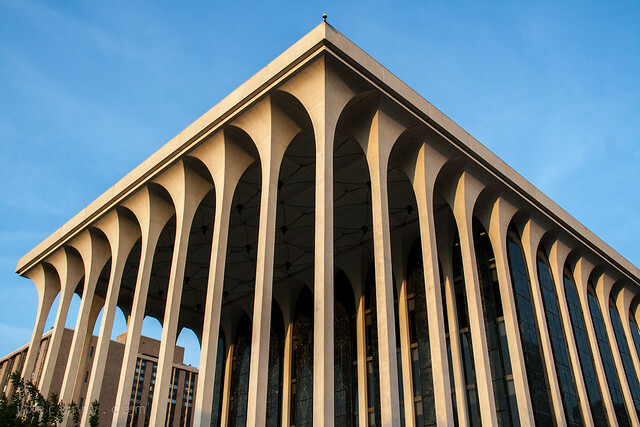 Readers: What’s your favorite Twin Cities architectural landmark? I have several on my list, but am keen to hear some ideas for future photo fodder. 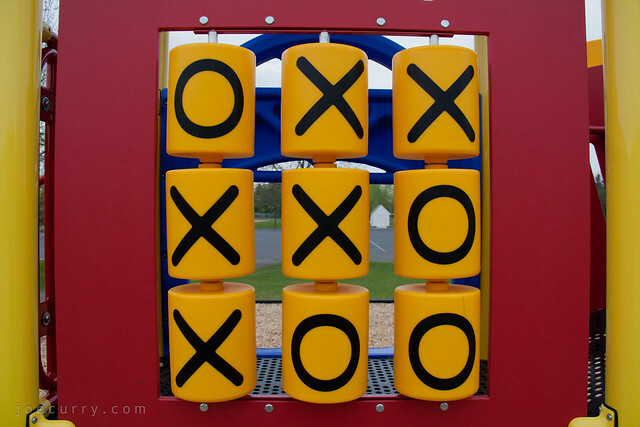 There’s some irony that today’s photo is from the playground. Because today, I began a search for something quite grown up: looking for a house that I XO. This morning I ran a 10K in rainy, 45 degree weather. The race followed the Mississippi River, with half the route in Minneapolis and the other half in St. Paul. It was a fun run, though May better bring warmer weather. 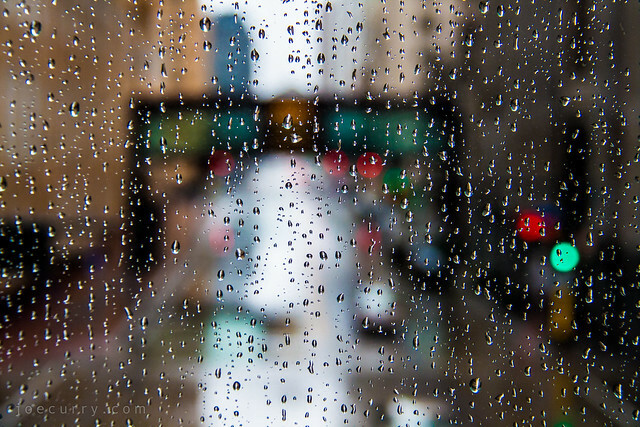 After a post race breakfast at Turtle Bread Company, I ran through the skyways to buy, what else, a raincoat. 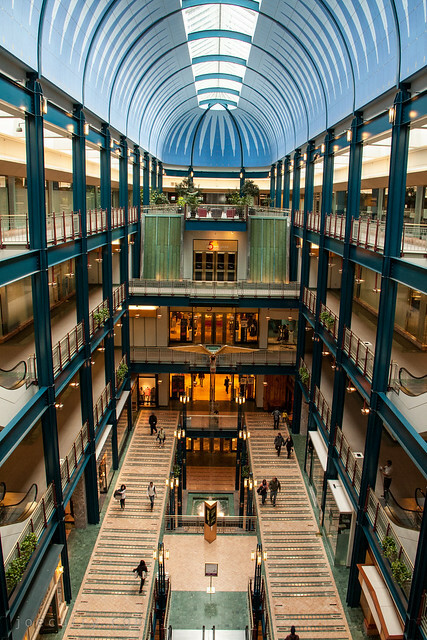 Gaviidae Common is a shopping center in downtown Minneapolis anchored by Neiman Marcus and Saks Off Fifth. The complex is spread over two city blocks and is built on the former site of the Donaldson’s department store. The “State Fare” food court is home to the single McDonald’s in downtown Minneapolis. It’s fine when I have a lunchtime craving, but doesn’t even come close to the revamped McDonald’s designs with the yellow brow arch. I miss the food and crew at “the Arch” on the corporate campus! 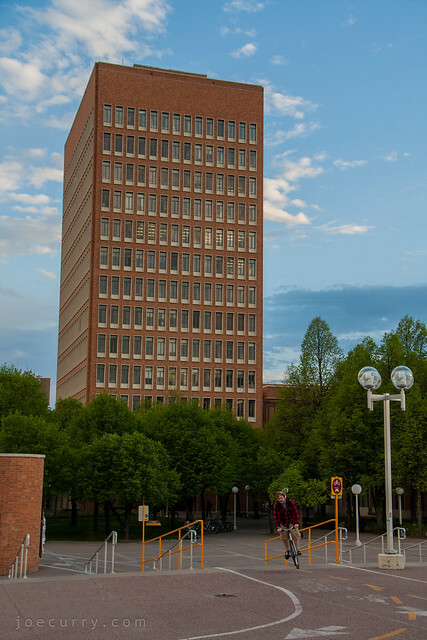 The Social Sciences building on the West Bank of the University of Minnesota isn’t that notable. But when I did visit that building during my college years, it was for notably nerdy reasons. With a student body of 51,000+ students, I was determined to make my college experience as personalized as possible. After all, I graduated from a high school class of 51. Aside from obvious things like attending class and studying the course material, I nearly always sat in the second row of auditorium classes. And I always made a point to attend the professor’s and TA’s office hours at least several times a semester. It’s the best kept secret to getting more out of your college education. Professors are required by the university to hold office hours, and very few students attend them. But I sure did! 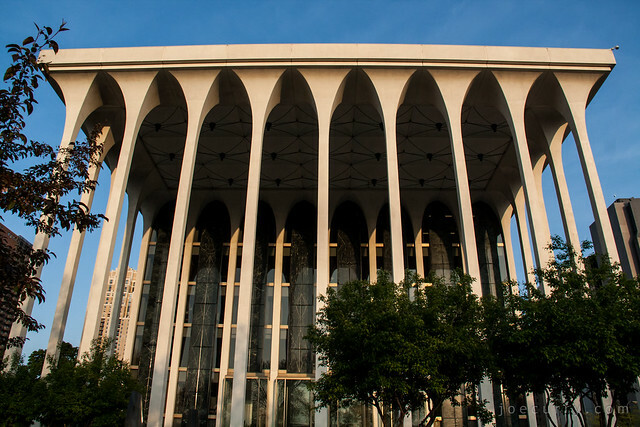 This building played an integral (pun intended) role in learning calculus and economics outside the classroom. Here’s a view near my apartment. 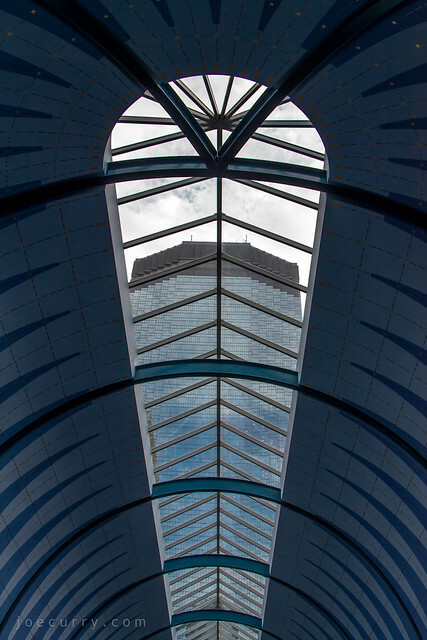 You’ve seen bits and pieces over the past couple months like the clock at St. Thomas and reflections outside their School of Law, the blue and gold exterior of LaSalle Plaza, the Fast Print shop, and the Skyline Aquarium. My aunt works in the Cappella Tower, the skyscraper in the center with the halo. I work in Target Plaza, the tall building to the right. There are two towers, and mine is actually the shorter 14-story building to the immediate left. You can see the 13th and 14th floors peeking out at the top. What you can’t see is the downtown store on Nicollet Ave. where I do Target runs several times a week. If you look closely on the West Bank of the University of Minnesota, you’ll find trees bearing strange fruit near the Washington Avenue bridge. 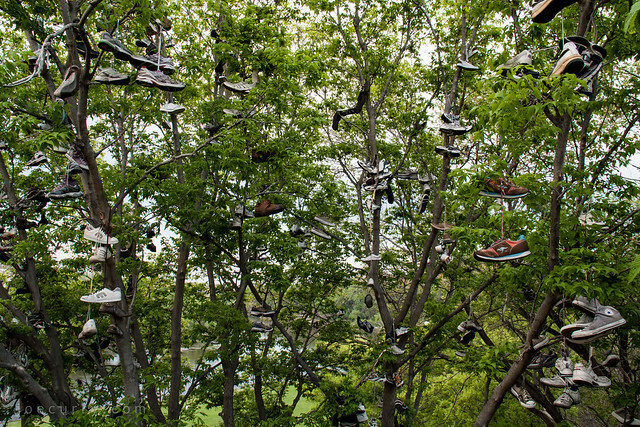 The tree branches are loaded with shoes–maybe a couple hundred. Although I was a campus tour guide for four years, trips to the West Bank were rare, so the folklore behind this campus tradition was not part of our script. It’s just as well. 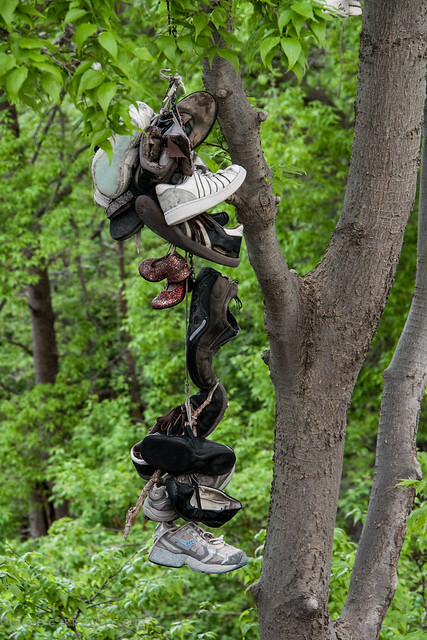 Theories abound, but no one really knows when or why the shoe tree started. It’s quirky and fun. It’s just something students do.